There is an old wives' tale that a duck's quack has no echo. This has been proven not to be true in what can only be described as the best duck experiment ever. But the rumor has a basis in truth. Believe it or not, inventors were excited by the idea that a duck's quack might not echo. Echoes cause a lot of trouble for people, like opera attendees, who want a great listening experience. They cause more trouble for people like airport passengers who just want information without it rebounding up and down the building and becoming unintelligible. If a quack eliminated echoes, as it was said to, perhaps people could build the practical aspects of a quack into a speaker system, or the effects of a quack into the walls, and everyone would be able to hear more clearly. So it was a sad day when researchers finally got a duck into the lab and found out it wasn't true. 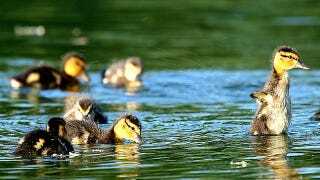 Researchers at Salford University's Acoustics Research Center brought a duck into both a reverberation chamber, which emphasizes echoes, and an anechoic chamber, which so masks any sound that it has been said to make people inside of it ill. They recorded the duck's quacks and found soon enough that it echoes just like any other sound. They then took their recordings to a sound simulator, and figured out what a quack sounds like in various environments. After many tests, they pinpointed why ducks were said not to have echoes. A duck quack is longer than many other animal sounds, and it trails off towards the end instead of stopping abruptly. An echo is what happens when a sound wave travels outward, bounces off a far surface, and comes back. It comes back more quietly than it went out, because some of the original force is dispersed. If the duck's quack were shorter, there might be a space of quiet, and then a distinct echo. The protracted quack lasts long enough that the echo often overlaps with the end of the quack. A person might still be able to tell there was an echo if the duck quacked at one steady sound level, because as soon as it stopped, the sound level would ratchet down suddenly. Instead, the quack trails off, so that the last of its sound blends with the returning echo. The duck's quack masks the returning echo, and people began to think that it was a miracle of acoustics. It's a shame. I would love to hear airport announcements done in Donald Duck voice. Via eHow and the BBC.